Character education and service learning are integral parts of life at Norwood and have been so since the School’s founding in 1952. We believe that addressing matters of the heart and spirit as well as the mind and body throughout the School’s curriculum and activities will help our students learn to lead life well and to find satisfaction in respecting and helping others. We have long believed that education at its heart is a moral endeavor and that a school should stand for and teach a basic set of values, beginning with the pursuit of knowledge and respect for self and others. Throughout our history we have sought to teach our students that they should treat others with the kindness and respect with which they themselves would like to be treated, a basic value at the heart of major faith and philosophical traditions. Our commitment to do this work without promoting a particular religious tradition is a tremendous attribute, distinguishing us from other schools, both public and private. We have affirmed the importance of teaching children at Norwood about religion and spirituality and about ways of living a good and meaningful life and connecting with something greater. We believe that how you lead your life matters just as much as what you know or what you can do. Each morning students at Norwood participate in a community gathering called chapel. Either as a whole school or in lower school and middle school groups, students and teachers come together to prepare for the day through singing, reflection, and lessons related to our core values. Chapel is also a time to celebrate special national, global, cultural, and religious holidays and recognize important current and historical events. Chapel lessons are designed to instill intellectual, moral, and spiritual growth as well as a sense of things greater than ourselves. While presentation topics vary widely, they often connect back to goodness, human dignity, and caring for others and our environment. Like the curriculum at Norwood, chapel includes stories and music from many cultural and religious traditions from around the world, embracing and highlighting the rich diversity of our community. While it may seem like a small thing, a morning handshake and greeting from the head of school and division heads is a friendly and respectful way to say, “You are a part of a community and we care about you” to each and every student as they arrive for a new day. After their morning handshake, students greet classmates and faculty in their homerooms and advisories and then attend chapel as a group. Norwood focuses on a set of core values as a school, with one assigned to each month. These values are discussed in the context of daily chapel and in the classrooms through age-appropriate stories and examples. Students apply these values to their daily interactions with classmates and their community. 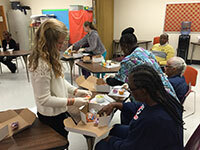 The community service program seeks to establish within the Norwood School community a sense of civic responsibility rooted in the habit of service. The program provides a wide variety of opportunities for children to reach out to the broader community with a caring spirit and an active willingness to serve. Values such as compassion, sharing, responsibility, and respect for others are discussed in chapel and in class. Projects that carry the school community from articulation to action instill awareness of the myriad needs of others. 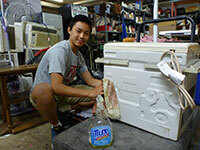 Grade-Level Projects: Faculty, often with the help of parents, explore opportunities in which unselfish actions and attitudes of acceptance can be practiced through a class project. Each grade, pre-kindergarten through sixth grade, has its own age-appropriate project that is managed by teachers. Examples include service projects on behalf of the National Institutes of Health Children’s Inn, Martha's Table, National Center for Children and Families, and So Others Might Eat (SOME). 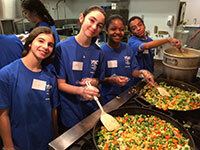 Seventh grade students rotate through five off-campus community service projects. Examples include Centro Nia, the Poplar Spring Animal Sanctuary, and a geriatric day care center. Seventh grade students also spend one morning at Norwood doing work needed in the school community. Eighth grade students pick one project and devote all six of their community service mornings to that agency. In addition, seventh and eighth grade students are given the opportunity to participate in Quaker work camp weekends in the District. In all grades, teachers guide students to reflect on their service experiences to deepen values of respect, caring, and compassion. Service Dinners: Seventh and eighth graders are offered the opportunity to participate in service dinners through the Youth Service Opportunities Project. Typically held on a Friday evening, these dinners are prepared by Norwood student volunteers who then serve the meal to people experiencing poverty, hunger, and homelessness. The entire group enjoys good food and conversation together. School-Wide Efforts: The Norwood community participates in school-wide events to support two organizations: Manna Food Center, the largest food bank in Montgomery County, and Horizons Greater Washington, which offers summer and weekend academic enrichment programs for low-income students. Norwood serves as a Horizons site school for children participating in the program from Rock Creek Forest Elementary School. Training in Philanthropy: Every graduating class raises money for a class gift that they donate to a charity. In seventh grade, students choose the charity after a long and deliberative process. In eighth grade, students fundraise and educate the community about the organization. All members of the Norwood community participate in a school-wide effort to reduce, reuse, and recycle, as well as to continually investigate and address new avenues to be a greener school. Activities include efforts to eliminate unwanted/junk mail, monitoring the recycling and composting bins, and encouraging others to follow practices that contribute to the sustainability of our campus, community, and world. Throughout the year, students and teachers present on environmental topics during chapel and other school assemblies. For example, our second graders share their research reports on the Amazon rainforest and sell handmade bookmarks, decorated with a variety of rainforest animals, to raise money for the Nature Conservancy’s “One Billion Trees” initiative. At the start of every school year, each of our youngest students is paired with an older student “buddy.” Norwood Buddies get together throughout the year for a variety of activities, including reading to each other, attending class performances, making crafts together, and sitting together at Community Sing. Buddies of all ages are excited to bump into one another both in and outside of school, even years after being paired. The Norwood Buddies program as a whole promotes respect and responsibility as well as a sense of community for students and their families. To emphasize Norwood’s commitment to good citizenship, all progress reports include comments on how students conduct themselves. Beginning in fifth grade, students also receive citizenship grades that reflect their personal contribution to the well-being of the Norwood community. Teachers evaluate students on their ability to demonstrate personal responsibility, integrity, and respect for class and school policies, treat adults with respect, and to treat adults with respect, and to treat peers with kindness and respect. Depending on the grade and topic, coordinated instruction occurs in homeroom, advisory, science, physical education, and/or dedicated life skills classes. At all ages, the program establishes skills and strategies for lifelong well-being and promotes caring for the well-being of others. Throughout the program, teachers emphasize the important role students’ own family members play in guiding goal-setting, problem-solving, and decision-making. Sorting and cleaning produce at DC Central Kitchen. Enjoying the city during a Washington Workcamp Weekend. Preparing for guests at a YSOP dinner. Making a new friend at Poplar Animal Sanctuary. Sorting and organizing donations at A Wider Circle. Sorting food donations for Manna Food Center. 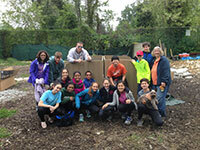 Working in a community garden during a Washington Workcamp Weekend. Clearing debris at the National Audubon Society. Painting pumpkins for The Children's Inn at NIH. Each month, the Norwood community focuses on a special value of month with relevant lessons and activities in daily chapel, classrooms, and community service. Eighteen values are covered during two consecutive school years. Over the years, Norwood students, their parents, and faculty/staff have provided support for the following organizations in the Washington, DC area. A Wider Circle is a non-profit organization in Montgomery County that serves people in poverty. They have three main programs: a wellness program with workshops on basic life skills, a program which pairs volunteers with families in poverty to help them get out of their situation, and, lastly, the Neighbor-to-Neighbor program that provides home goods to families transitioning out of shelters, escaping domestic violence, or otherwise living without basic need items. We helped by folding donated clothes, sorting basic kitchen necessities, and organizing toys. It was a really rewarding experience because we could see the impact that these basic items were making on the recipients. The Armed Services Retirement Home provides a home for retired and former members of the U.S. Armed Forces. The AFRH is a modern, thriving retirement home with a focus on health and wellness. All residents have served in the U.S. military and share a common bond of defending liberty at home and abroad. Each of the AFRH communities has a Hall of Honor to celebrate our military heritage and honor all who served. Everyone visiting from Norwood is partnered with a person living at the AFRH and we go bowling with them. This is a unique experience because we get to know people who have special and unique stories, and who lived through the things that we are learning about in history. Each year, Norwood eighth graders select a charity that is meaningful to the entire class. Throughout the year, they raise money for a class gift to the charity. Promoting Equality in African Schools (PEAS) is a charity our eighth grade class has grown very close to over past two years. However, we wanted the whole school to feel a connection to the organization as well. We wanted everyone to feel informed about our progress, and how we are planning to make a difference. To educate the community and spread the word, we have given presentations to students, made posters, hosted bake sales, and have incorporated donations for PEAS into school events. We are very happy and excited about the money we have raised, and want to thank you for your support of our charity. The purpose of Food & Friends is to foster a community caring for men, women, and children living with HIV/AIDS, cancer and other life-challenging illnesses by preparing and delivering specialized meals and groceries with nutrition counseling. We organized and packed lunches for the patients. 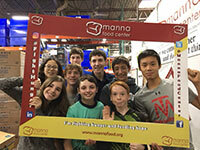 For those who decide to volunteer at Food & Friends when you’re in eighth grade, I want to say that something that I found very motivating is the fact that the employees constantly express how appreciative and thankful they are that you decided to spend your time volunteering at Food & Friends. I also suggest trying something new and stepping out of your comfort zone because packing lunches for patients with illnesses wasn’t something that I had a lot of experience with, but as I spent more time at Food & Friends I started to enjoy it so much that I asked my mom if my family and I could volunteer there during the summer. This charity helps the elderly have a place to stay during the day while their loved ones are at work. They get to participate in physical and mental activities that keep them busy. They get a meal for lunch and when they are not doing scheduled activities, they can sit and read the newspaper. The Geriatric Day Care Center doesn’t only help its elderly residents, but also their families who are busy during the day. It gives them the comfort of knowing that their loved ones are being taken care of. Doing service there is great because you always know every time you smile at someone you made their whole day. Katherine Thomas School provides a great educational experience for children with moderate to severe language and learning disabilities, mild to moderate autism, mild intellectual disabilities, and other health impairments. We played games like Apples to Apples and Heads Up to help with reading and speaking. 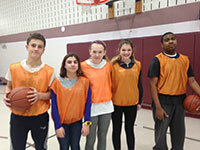 We played sports like soccer, basketball, and dodgeball to help with hand-eye coordination and improving athleticism. We also stayed to talk with students at lunch and play with them during recess. The entire time we were at KTS, we had so much fun and made many new friends and memories. When many of you think of Manna, you probably think of food drives which equal a free dress day at Norwood. This year I personally got the chance to go to Manna to see how it works. The work is very meticulous but very rewarding. You spend the majority of time sorting cans and checking dates. At the beginning when you start, there are five huge blue bins filled to the top with donated food, but by the time you’re done sorting, it’s rewarding to see what you’ve accomplished. I urge you to donate food for the impact of knowing that you gave someone food. It doesn’t have to be at Norwood but whenever possible give food and know that you are giving someone food for their family for one night, eliminating hunger one can at a time. Martha’s Table is an organization based in Washington, DC that provides healthy food, affordable clothing, and opportunities for low-income families. In 2015, they distributed over one million meals, provided clothing to over 10,000 people in need, and provided education for over 200 children. Every night, Martha’s Table has trucks that go to different areas in DC to feed the hungry. When I went there, my group chopped a lot of vegetables that were used to make a stew that was distributed that night. I felt happy and rewarded knowing that hundreds of hungry people were going to get food that night because of what I had done that day. Poplar Springs is an organization dedicated to saving animals that have been treated cruelly or abused. They take animals from owners who have treated them awfully and place them in a farm where they can recover. Our group shoveled goat poop and tended to pigs. When we finished our work, we fed the animals grapes and animal crackers. This is a good charity because they are doing something about the horrible conditions that some animals are subjected to. Red Wiggler’s mission is to have a sustained farm where people with and without disabilities can come together to grow healthy food, work, learn, and create a friendly environment. When I went to Red Wiggler with my advisory, we put up fences to protect the farm’s crops from food-seeking deer. I enjoyed this charity because it felt like we were really helping the community work together. It showed that when people really want to, they can do anything together – no matter how hard or easy the task. When we first arrived, we prepared meals at DC Central Kitchen. The mission of DC Central Kitchen is to make over 5,000 meals a day to give to homeless shelters and nonprofit organizations. The next morning, we prepared sandwiches for homeless people residing in Franklin Park. Within minutes, the sandwiches were gone. This was one of my favorite parts because we had the chance to see the impact that we were making. Next was helping at a local community garden, which was still in the making. We helped build and carry, but also clean up by removing rocks, which would allow people to plant there. The next part of the trip included working to clean up people’s yards, by building a garden and doing some yard work that was not able to be completed by the residents that lived there. YSOP (Youth Service Opportunities Project) engages youth, college students, and adults in meaningful service experiences through an innovative program that combines an orientation to the issues, hands-on volunteer work, and reflection. YSOP inspires participants to broaden their perspectives and become engaged citizens. Norwood volunteers prepare and serve a meal to guests. Not only do we make the food but we get to interact with the guests, which I had never done before. The guests were very kind and loved having our company. For my bat-mitzvah project I decided to donate 50 blankets and allow the guests to take a blanket to bring with them. This was very meaningful to see how much they appreciated the blankets that I had worked hard to make.